This is another of the stocking fillers I've made for the kids, they both seem to like puzzles, they found a version of this puzzle on a maths website they use, so I thought I'd make them a physical version of it. 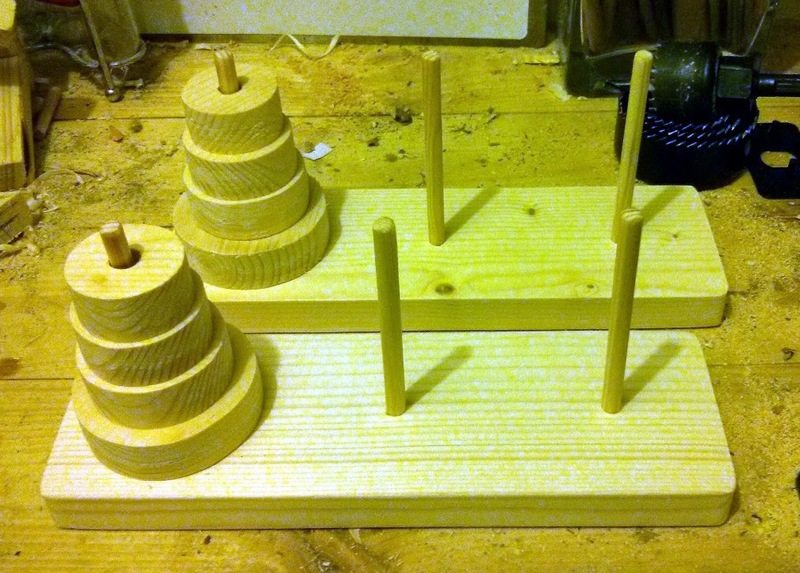 The Tower of Hanoi is a mathematical puzzle, the idea is you move a series of different sized discs from one side of the board to another, you can only move one disc at a time and you can't place a larger disc on a smaller disc, they vary in complexity, basically the more discs there are the harder it is to solve. I stuck to four discs. 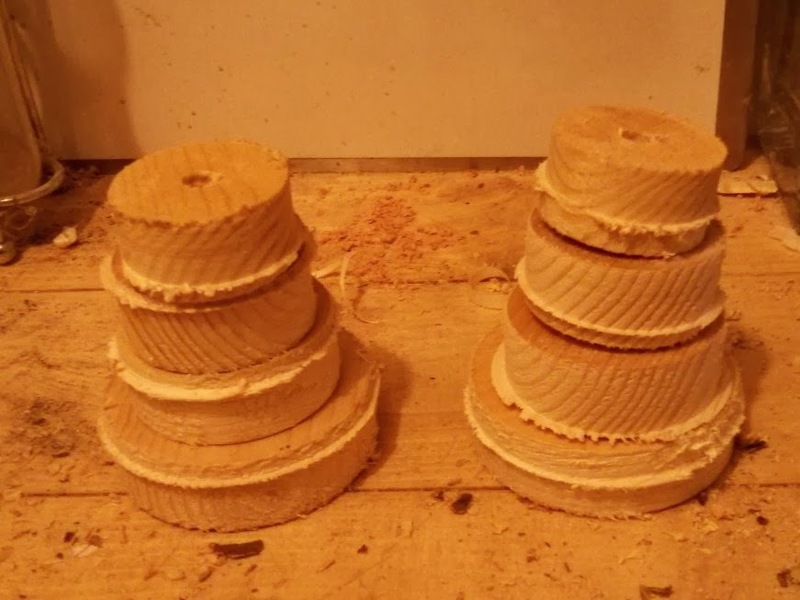 These are very easy to make, especially if you have a set of hole saws, but basically you'll need a piece of wood, mine is 7cm wide by 22cm long, some dowel, I've used 9mm dowel, and for the discs I just used offcuts I had lying about. 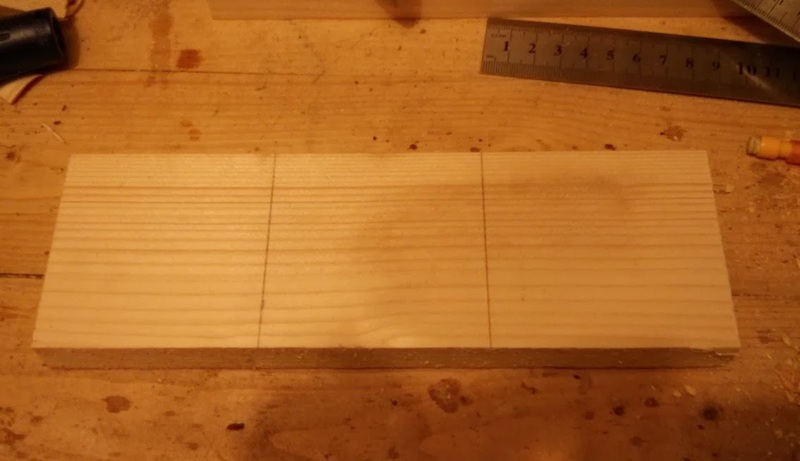 Divide the base into three parts, as mine was 22cm long this worked out at 7.3cm, and mark the wood at each point, you should now have three squares marked out. Next we need to find the centre of each square. 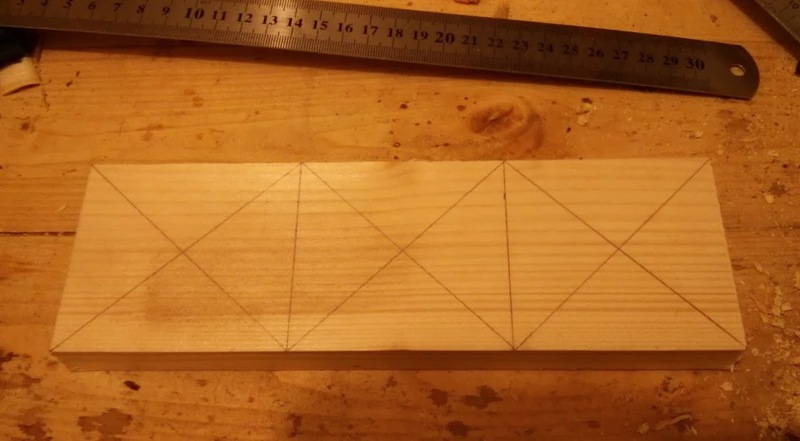 Next we need to mark where the three pegs will go, these will be in the centre of each square, now remember to leave enough room between the pegs for your largest disc, as mine was 6.4cm (64mm) and I'd divided the wood into three 7.3cm wide squares I had enough room. To find the centre of each square is just a matter of drawing lines from corner to corner, this should give you the centre. For the pegs I cut 6 lengths of 9mm dowel to 10cm and then I drilled out the base to about half way through, the pegs are long enough to allow for the thickness of the discs and for about 5mm to be glued into the base. The discs themselves I just cut out with my hole saws, hole saws are handy for this because most sets will have a variety of sizes, so it's easy to make a set of discs that start large and then get smaller. Apologies for the terrible picture. And that's about it, not much else to this really, I painted the discs in different colours, again using the water based enamel paint I've used on various other projects, the total cost for both of these is no more than £4, although I made these from scrap bits of wood, so technically they cost nothing. I've also made them both a large wooden dice, this was just a bit of fence post I cut into a cube shape, sanded and then marked with the numbers a dice has on it, the bit of fence post I made them from cost 50 pence, they are always looking for dice to use in the games they make up, and these aren't so easy to lose as normal sized dice. Not as hard to lose as normal dice. I have also made the kids their own flat pack bird box kits, for them to assemble themselves, but that's for another post.